As future global leaders, you will find no better opportunity to gain new perspectives and insights than studying abroad. In addition to cultivating broader awareness, these experiences will allow you to apply knowledge gained in coursework to real world situations outside of the classroom. Further you will sharpen important language skills and make meaningful memories and friendships all in an unforgettable, energizing setting. From considering destinations to course scheduling, from financing your trip to taking all the right health and safety steps, the AgCenter Global Network will help assemble the tools you’ll need to make your study abroad decisions. 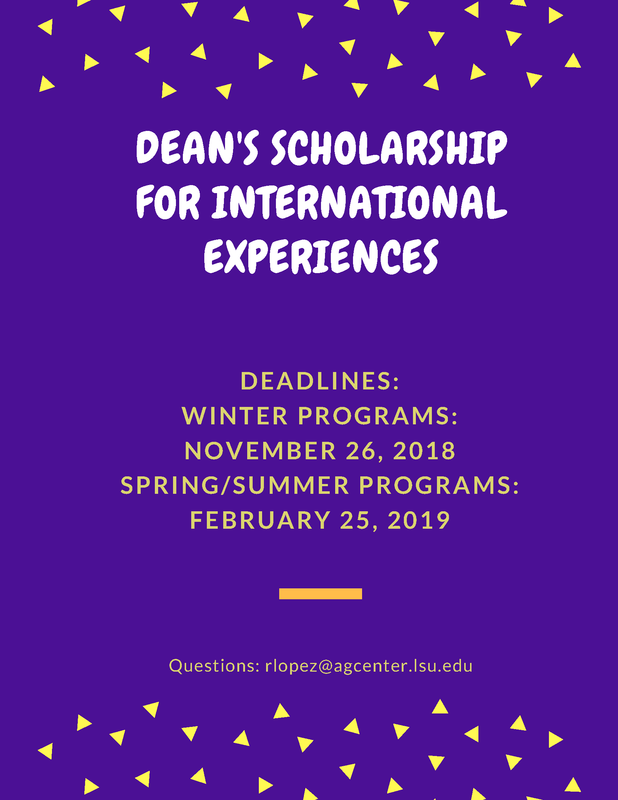 Facilitating Studies abroad is one way that LSU and the LSU AgCenter are creating global citizens, and we assure you that the insights you’ll gain through global immersion will be both memorable and impactful in your college career and beyond. The Dean's Scholarship for International Experiences is now open for applications- Apply today! How Can This Impact My Future Career? Studying abroad enhances global skills like communication, adaptability, and diplomacy. Choosing the right Study Abroad program can be a challenge. There are numerous factors to consider, but the best way to ensure the best fit is to communicate with your academic advisor early and often. LSU Academic Programs Abroad (APA) offers both faculty-led and semester abroad programs in various countries around the globe. The College of Agriculture international relations team will work directly with LSU APA to ensure that you find the right program. Travel to Celestun, Mexico for a field-intensive course focused on natural history, ecological restoration, and research techniques. This program exposes students to the rich history, politics, literature, music, and culture of London and Edinburgh. This program exposes students to the issues central to sustainable agricultural development. Study megafauna, food web dynamics, and coastal processes. Tour Nicaraguan commodity facilities to explore the rice, tobacco, horse, and banana industries. Explore the political, historical, cultural, and social issues surrounding agriculture in Poland. Explore the topics of culinary techniques, socio-cultural and ethnic food consumption, food issues and trends, food safety and sanitation, and the role of food in the promotion of a healthy lifestyle.